What stops us from achieving our goals in life? What are reasons we all give for not doing what we say we’re going to do….generally “I don’t have time” is one of the most common (for me anyway….). Life is so busy!! With work, housework, kids, and generally trying to stay sane….it’s easy to see why we just don’t feel we have the time for all those other goals or interests we might have. I don’t know how long now I’ve been saying I want to get fitter and build regular exercise into my life, but I’ve always got an excuse. I’ve also got projects I wanted to work on in 2018, such as decluttering my house by the end of the year or starting this blog. However, day-to-day life and drudgery feels like it just takes up all of my time. However after watching so many productivity videos (thank you muchelleb & Amy Landino) and listening to podcasts (my favourite thing to do) such as The Productive Woman, I’ve begun to realise that it’s my perception and way of thinking that is holding me back! A common theme that comes out of everything I’ve read or heard, is the need to prioritise the things that are important to you…not necessarily the things that are shouting the loudest for your attention. Things that are important to you, should be scheduled into your calendar, giving you the time in which you’re going to work on them…otherwise your time gets taken by all the small stuff….and you “don’t have time” to fit the important things in! I’ve thought about this a lot, and worked on trying to set up a schedule for the coming week in iCal. 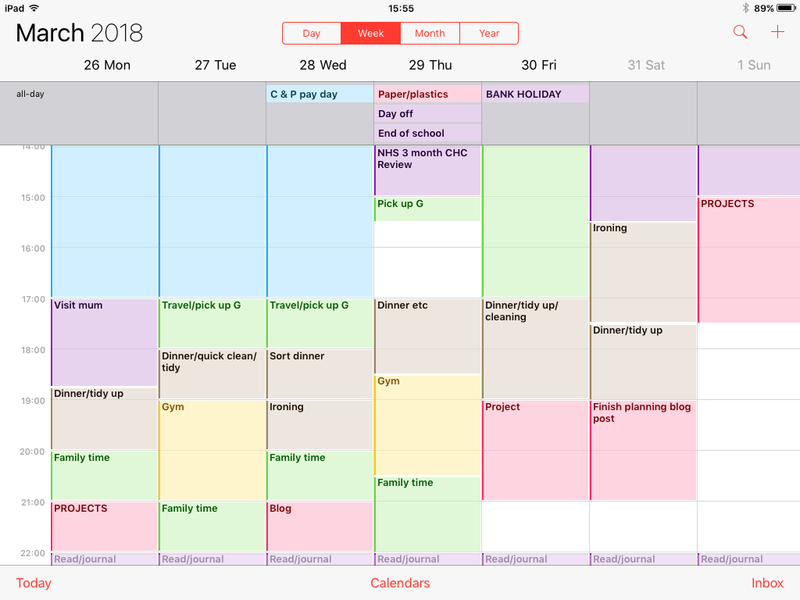 I’ve set up Time Blocks where I can work on specific projects, or where I’ve scheduled time to do something specific that is important to me, such as visiting my Mum. For the least fun, but necessary tasks….such as ironing or cleaning….I’ve used Parkinson’s Law, setting a time limit for the tasks to be completed. Otherwise I know that I could literally spend a whole weekend just cleaning, washing & ironing! Although I had been doing cleaning in the evenings, I found this made me more exhausted and I didn’t really get any time to relax before bed. So although I have daily habits to wipe over the kitchen and bathroom and generally tidy up, I do not plan to do major cleaning until Friday or Saturday, and then only for 3 hours max. If I haven’t done it by then, it’ll wait. 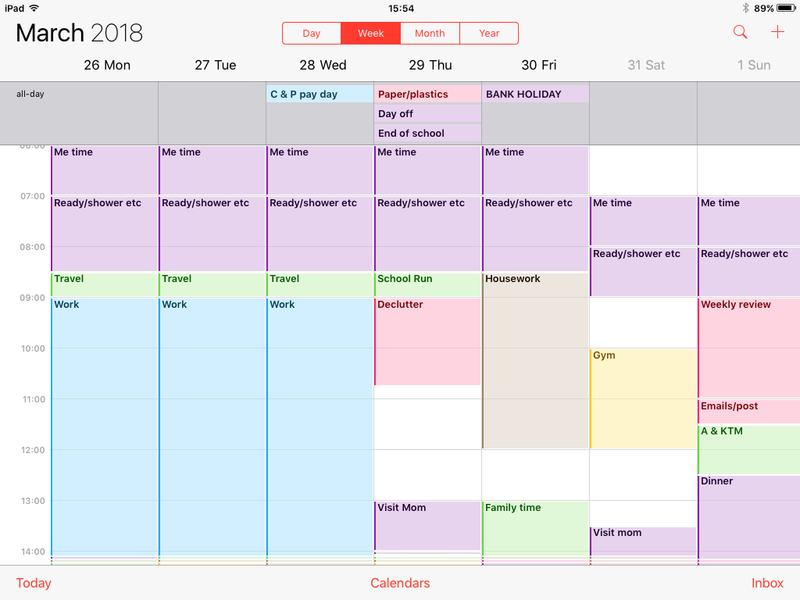 So here is my calendar for the next week…there are empty spaces so I have some flexibility. Naturally even the best plans can change, so I am in no way expecting the week to follow this exactly, but it feels good to have the most important things scheduled in, anything else can fit in around that. 21st March 2018…..The ups and downs….